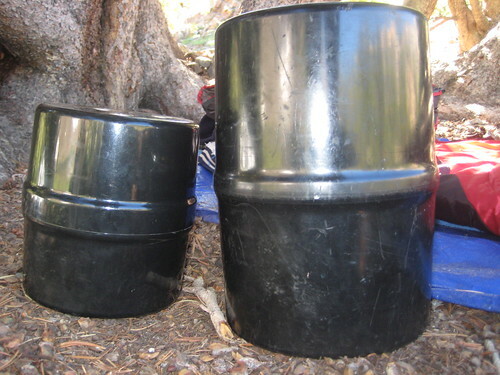 Yosemite Forum • View topic - How does one pack in a bear barrell? My partner and I are coming from Toronto Canada where the bears are still mystified by food packs hanging in trees, so we've never used a barrell before. We're planning on renting one at the Meadows, but how do you pack it with your gear? Figured we'd just get a small one as the two of us will only be wilderness camping for 3 days and car camping the rest of our time in the park. Do you hang it on the top or bottom of your pack - do you need to bring straps to do that or do they come with straps? Any suggetions from barrell experienced hikers would be appreciated! I have seen all manor of styles. I pack mine in my backpack, its kind of bulky but it fits. Others strap it to the top or bottom. It really depends on the size/kind of pack you have and how much gear. They do not come with straps and there is no place to affix straps, besides encircling the can. When you camp do not leave any ropes or straps attached because the bears can carry the can away with the strap. I always put mine in sideways at the bottom of the pack. above a fleece jacket on a smaller pack. and cool. When not inside your pack put it in the shade. black Garcia Bear can (the one they rent). Pack it inside. Your food will heat up too if exposed to the direct sunlight. Because it is heavy, pack it as close to your back as possible and about midway up the pack. Re: How does one pack in a bear barrell? They only rent the Garcia, in one size, which should be adequate for you and a friend if you are very careful on how you pack it - if you aren't careful you may find yourself renting another for your friend, as a father and son had to do - I met them in Yosemite in a backpacker campground and they had to ask if they could have some space in the bear box in our campsite, as they could not get all their bulky food in one can. They had brought regular food from home and were cooking full on meals - canisters work better for folks who bring freeze dried or dehydrated stuff. It packs smaller and does not mind being smashed in. Your first day's food does not need to go in (unless you fail to eat it all the first day), just anything you need to store overnight, so make sure you take the bare minimum of toiletries, small bottles and tubes, and take an extra gallon ziplock to contain your trash. All food items should go into ziplocks - no cup a soups still in the cup, no boxes, no plastic clamshell thingies, nothing that takes up space unnecessarily. All trash and hygiene items and food must go in. All lip balm, sunscreen, medications, soap, etc. Things like couscous, soup mixes, trail mix, rice based dishes, anything that takes some compression and is still edible works. Big soft breads don't fit as well as tortillas or flatbreads. On the rare occasion someone gives me a store bought backpacking meal I repackage it immediately into ziplocks, either pint or quart size, usually freezer bags since they hold up better. I carry bear cans either upright in the center of the pack (for a larger one, on a longer trip) or horizontally in the top two thirds of the pack bag. I like having the weight higher in the pack. Some folks stuff the can down inside where the sleeping bag usually goes, some attach it right under the pack lid. I find that trying to lash it on top or the side of the pack can result in a can bouncing down the trail, not good on a steep slope. Best to keep it inside as mentioned - black cans absorb a lot of heat. If you have a narrow pack and the can won't fit horizontally you may have to put it in vertically. Here is a couple of pics I took last weekend. A friend had an older Garcia model (newer model is somewhat smaller and tapered on the ends) and I brought the smallest can of all, the Bare Boxer (which can be bought in Yosemite stores for forty dollars and is adequate for a weekend if packed carefully). I packed three days of food, first day outside the can. 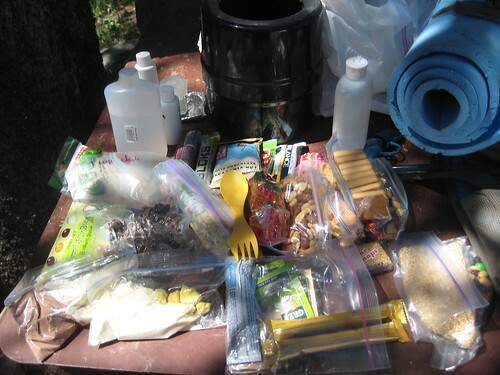 Everything except the flip top bottle (which was stove fuel) went inside the can, and I had room for trash and small packets of medicine and the little tubes of sunscreen and bugspray. (the other bottle was rum. ) The little bottles behind the rum are some olive oil, garlic salt, (for prepping fresh caught trout should there be any) and baileys for coffee. The Bear Canisters are great. How you pack it depends on the kind of backpack you have. If you have an internal or framless backpack, you'll want to pack it INSIDE. First pack your sleeping bag and then the bear canister. If you have an external frame pack, you can either pack it inside similar to how you would with an internal frame pack or you can actually lash it onto the outside. It probably wouldn't hurt to bring an extra lash or bungee. "Hunger, thirst, cold, fatigue, your own physical and mental limitations, you will feel all of these. This teaches you about nature, more than that, you come face to face with yourself. " They only charge $5 per day and its well worth it IMO to have an extra. For car camping, I am pretty sure you are required to keep the food in a cannister instead of in the trunk. At a developed car camping spot there would be bear boxes though. As I have only used them on one 6 day trip, my experience is limited. But I would take the daily maximums kind of like tent maximums. E.g. you can technically fit 4 people in a 4 man tent, but that doesn't mean its necessarily a good idea. Bart.T wrote: They only charge $5 per day and its well worth it IMO to have an extra. $5 per day? rentals in yosemite are $5 per trip. Unless you rent a bearikade by mail those are $3 per day. 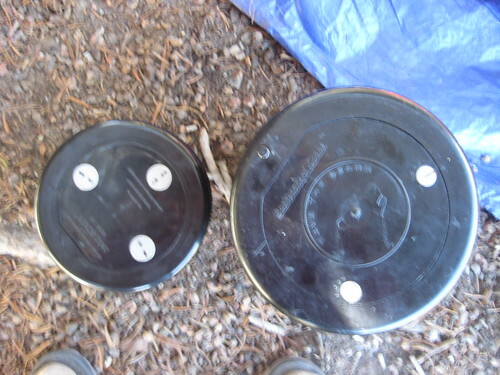 I can't imagine using a bear canister for car camping, in areas where bears break into cars, there will be bear lockers, in areas where bears do not bother cars, put it in the trunk. The more experience you have packing a bear canister, the easier it gets. You start to choose more packable items and repackaging things so everything will fit. I get 4 days of food into the small Bare Boxer and 5-6 days into a BearVault Solo, general guidelines for those are 2 days (boxer) and 3 days (solo). its well worth it IMO to have an extra.